Planning an IELTS essay. 5 steps to take before writing your essay. 5 steps you should take when planning your IELTS essay. Planning is extremely important before writing an essay in writing task 2. (also for writing task 1) Most teachers have different advice for this, some say 2 minutes others say 5 minutes and yet others say 7 to 10 minutes of planning time. I believe that you should take at least 10 minutes to plan. Why? because I have had students before with good English skills who did not take the time to plan, they ended up with a Band 5 even though they were capable of a Band 7. Those students did minimal planning and just went straight into writing, lost track of what to write about, went off topic, didn’t structure the essay well and so on. This is where problems can arise when writing an essay. However, with the right steps in place you can go into the exam feeling confident of writing a good essay. This is a crucial step to take because if you don’t fully understand the task question, you might end up writing a different essay. You could also just end up writing very generally and not about the issues in the question. This will affect your task response score. For example here is a task question and analysis. 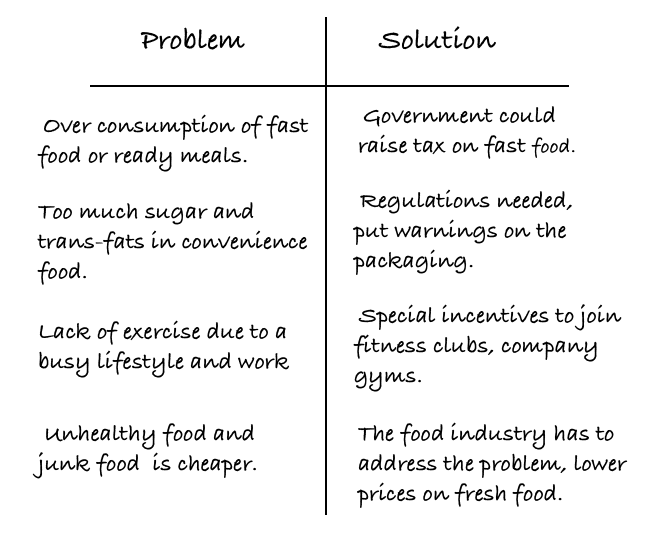 The general topic is about obesity, however, we need to focus on the issues. Keywords such as “all over the world” “societies” ” affects children adults” “growing problem” It is important to write about the issues by looking at the keywords, not just a general essay on obesity. Instruction words: These words show what kind of essay you will need to write about, click here to see more about the 5 essay types in writing task 2. In this case the instruction words are: “what are the reasons for this?” and “how could it be tackled?”. I just need to write about why it’s a problem or the reasons for the problem and suggest ideas to solve the problem. I can mention this in the thesis statement in the introduction. Step 2: Look at the instruction words so that you know what kind of essay you are going to write about, make sure you write a good thesis statement. Click here to see more about thesis statements. This is probably one of the most difficult parts for most people in Writing task 2. Some people think they should just brainstorm ideas like a mind map thing and then start writing. No, this will waste time and you will have far too much information. You only have 40 minutes to write the essay so you need to go straight into generating ideas. Here are 2 ways to do this. Imagine you are having a chat about the task question below with a friend. 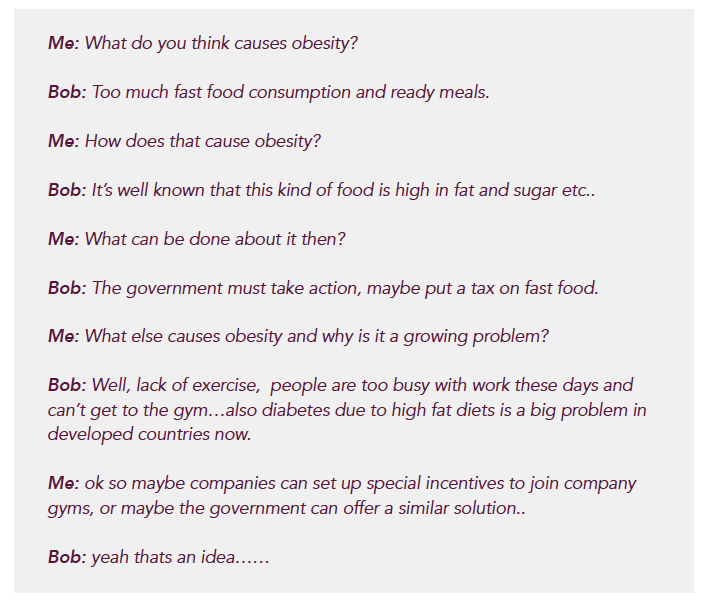 (see my example below with my friend Bob) Ask lots of questions and note the answers, this will help you get ideas. but be selective, stay on topic and only choose 1 or 2 ideas to write about. Note that this transcript above is not to be written down, it is an example of an imaginary conversation I have had. The point to this is to make notes based on the ideas you get from the ‘conversation’ in your head. I know it sounds crazy but it is very effective for getting ideas quickly. 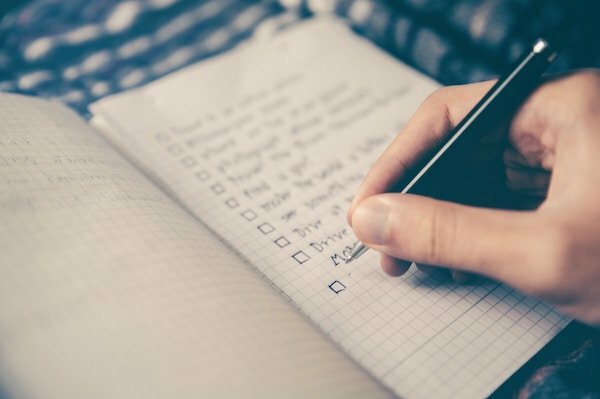 If you don’t feel comfortable with the approach above you can make a list like below, this is handy for getting ideas if it is a problem solution essay or an advantage disadvantage essay. On the left are the problems on the right are the solutions. As I mentioned before, be very selective when writing. In a problem solution essay you only need one problem in main body 1 and one solution in main body 2 of the essay. If you feel confident in writing, you could have 2 problems and 2 solutions. It is the same for an advantage disadvantage essay, one advantage and one disadvantage. Do not write your essay like it were a list. Focus on one central theme per paragraph. The body paragraphs should have a topic sentence, supporting sentences and a specific example. Main body 1: State the problem, supporting sentences, specific example of the problem. Main body 2: State the solution, supporting sentences, state why this solution might be effective. The thesis statement is important as the rest of the essay will be based on this. The main body paragraphs expand on your thesis statement. Click below for a Free PDF showing essay structures. 4. Think about how to paraphrase the task question. Now you need to be thinking about the best way to paraphrase the question. This can be done with synonyms and you can also change the sentence structures around to keep the same meaning. Beware of synonyms though as sometimes they will change the meaning. This is where you need to have good vocabulary and the examiner is looking for your paraphrasing skills. Remember that you do not need to paraphrase everything, in many cases some words will stay the same to retain the meaning as there are certain words which are hard to paraphrase. 5. Get an idea of the Thesis Statement. After paraphrasing the task question you need to now think of a good Thesis statement. This sets up the essay for the examiner so he or she can see what the essay will be about. In an opinion essay the thesis statement will contain your opinion. The main body paragraphs will expand on your thesis statement and the conclusion of the essay paraphrases the thesis statement with the rephrased opinion again. It all looks a bit scary but once you practice planning then it will come naturally, take around 10 minutes to plan. here are the steps again to recap. Think about the best way to paraphrase the introduction. Think of a good thesis statement for the introduction. Practice your planning so that when you take the exam you will feel confident.